Yarn and Fiber Happenings: Celebrate Spring with an Ivy Brambles Flower Petals Shawlette and enjoy the Free Shipping now through June! Celebrate Spring with an Ivy Brambles Flower Petals Shawlette and enjoy the Free Shipping now through June! Celebrate Spring with an Ivy Brambles Flower Petals Shawlette and Enjoy Free Shipping now through June! Spring is for flowers! To celebrate, we bring you the Ivy Brambles Flower Petals Shawlette for you or someone you love! Beautiful in variegated or a semi-solid lace, Ivy Brambles Flower Petals Shawlette will bring a smile to your face while knitting and wearing. Elegant, beautiful and easy to knit, Flower Petals Shawlette pattern contains instruction for a beautiful lace shawlette that can be worked with or without beads. Only one skein of yarn is used to make this must have accessory of the season! 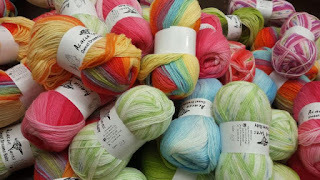 We suggest using one skein from the family of Ivy Brambles super-soft lace weight yarns including the Pure Silk providing superb drape, the beautiful softness of superwash merino Romantica yarn or the deliciously soft and warm Cashmere 2-ply yarn. It all depends on feel you like; all will be beautiful!. Beading is optional and beads are added using a size 12 crochet hook. The shawlette is currently shown on our website in Ivy Brambles Romantica Celosia colorway.